The aim of this study is to assess the levels of anxiety, depression and post-traumatic stress disorder (PTSD) in national aid workers in Central African Republic as well as to evaluate the effectiveness of a stress management group in reducing those symptoms. Twenty-seven stress management groups were evaluated in two international non-governmental organisations in which 197 national humanitarian aid workers took part. There was a significant decrease in the intensity of every psychopathological variable tested despite a decrease in the sample between the pre- and post-tests. At post-test, 8.1, 5.1 and 11.1% of the participants had scores indicating anxiety, depression and PTSD compared to 25, 18.9 and 26% at pre-test. The group intervention has demonstrated to be a realistic, effective and cost-effective way to respond to mental health problems in national aid workers living in a context of ongoing violence and where access to specialised services is extremely limited. Further research is needed to confirm these preliminary results, especially in other cultural and humanitarian contexts. In 2016, 288 humanitarian aid workers were the targets of deliberate violence: 98 were seriously injured, 89 kidnapped and 101 lost their lives while doing their work (Stoddard et al., 2017). Deliberate attacks on humanitarians have increased by 276% between 2000 and 2016 (Stoddard et al., 2017), exposing this population to a significant risk of post-traumatic related disorders. Among the victims in 2016, 85% were national humanitarian aid workers, that is, people who work for a national or international non-governmental organisation (NGO) in their country of origin (Stoddard et al., 2014). This high percentage is not surprising given that national staff represent around 90% of the international NGOs employees (Porter & Emmens, 2009; Stoddard et al., 2014; Taylor et al., 2012). Previous studies on national humanitarian aid workers report high scores of post-traumatic stress disorder (PTSD): close to 19% in Sri Lanka and Iraq (Eriksson et al., 2013; Lopes et al., 2013) and up to 26% in Uganda (Ager et al., 2012). One study conducted in Kosovo (Lopes et al., 2005) compared the level of exposure to traumatic events and its psychological consequences in national versus international aid workers. Although no difference was found in the incidence of exposure to traumatic experiences between the two groups, the highest level of PTSD was found in national staff (6.2%) compared to expatriates (1.1%). These results suggest that the material, economic, familial and emotional consequences of humanitarian interventions weigh more heavily on people who are the natives of the country in conflict than on internationals. Shah et al., 2007 also underline the high risk of secondary traumatic stress (STS) in national aid workers, which is known to be associated with aggravated PTSD symptoms (Schauben & Frazier, 1995). Aside from PTSD, the symptoms of depression are also widespread, ranging from 16.9% in national aid workers in Kosovo to 68% in Uganda. Other studies report the level of anxiety as high as 50% in national aid workers (Ager et al., 2012; Eriksson et al., 2013; Lopes et al., 2005). Research on the mental health of national humanitarian aid workers is extremely scarce, with only 14 studies identified in the most recent systematic review of the literature conducted in 2015 by Strohmeier and Scholte (Strohmeier & Scholte, 2015). Studies investigating the effectiveness of psychological interventions in this specific population was quoted as being ‘virtually non-existent’ in 2011 (McKay & Williamson, 2011, p. 93) and no additional studies could be found in the literature since. According to current knowledge, ‘it remains the responsibility of mental health professionals and humanitarian organisations to make decisions about the nature of early interventions offered on the basis of “best judgment”’ (McKay & Williamson, 2011, p. 93). A study investigating institutional psychosocial practices reported that the majority of NGOs offer defusing and debriefings after critical incidents (Ehrenreich & Elliott, 2004), despite the fact these techniques are clearly discouraged in the IASC guidelines on Mental Health and Psychosocial Support in Emergency (Inter-Agency Standing Committee, 2007). Although some organisations have started addressing the problem, the main constraint remains financial: one of the recommended treatment for acute stress disorder (ASD) and PTSD requires between 5 and 16 individual sessions of Cognitive and Behavioural Therapy (CBT) (American Psychological Association, 2017; Bisson & Andrew, 2009; Ehlers & Clark, 2003; Litz et al., 1997). Allocating the time and human resources required for that type of intervention is currently unrealistic in the current global humanitarian context. Furthermore, using techniques that involve exposure to traumatic memories in a context that remains violent includes the risk of increasing the participants’ sensitivity to further traumatic events.For this reason, the National Institute of Clinical Excellence in the United Kingdom (2005) recommends primarily the use of stabilisation techniques in traumatised individuals living in the situation of ongoing violence or exposed to political dangers. Encouraging evidence has emerged on the effectiveness of brief exposition techniques, such as Narrative Exposure Therapy, in adults suffering from PTSD living in refugee’s settlements in low-income countries (Mundt et al., 2014; Neuner et al., 2008; Robjant & Fazel, 2010). However, its effectiveness among humanitarian aid workers living in the context of ongoing violence has not yet being tested. The objective of this study is (1) to assess the levels of anxiety, depression and PTSD in a population of national aid workers in Central African Republic (CAR) living in a context of repeated and ongoing violence and (2) to evaluate the effectiveness of a one session stress management group in reducing anxiety, depression and PTSD symptoms in this population. The tested protocol, if shown to be efficient, may help international NGOs to honour their duty of care towards national humanitarian aid workers. The study was conducted in the CAR, a country that since its independence in 1960 has been through series of politico-military crises that have undermined its socioeconomic development. In March 2013, it entered a new phase of political and religious instability with a violent coup d’état held by a coalition of rebel groups. A Commission of Inquiry estimates that war crimes and crimes against humanity were committed by the two armed groups during the conflict causing many deaths, including that of 18 humanitarian workers (Amnesty International, 2015; Integrated Regional Information Networks, 2015). Despite the signature of a cease-fire agreement in 2015, the country still experiences periods of violence. The violence has seriously destabilised state structures, particularly the health system, which was already very fragile before the crisis. Access to mental health services is extremely limited in CAR, with only one psychiatric unit available in the capital city of Bangui. Therefore, the stress management group was designed as a single session intervention to develop and strengthen the self-care/self-help capacities of national aid workers. The intervention was developed in accordance with the first phase of the CBT protocol for ASD and PTSD (Bisson & Andrew, 2009; Foa et al., 2005; National Institute for Clinical Excellence, 2005; Van der Kolk, McFarlane, & Van der Hart, 1996). Each stress management group lasted 3 h and consisted of: (1) psychoeducation on normal, chronic and traumatic stress. A part of the psychoeducation phase was dedicated to traumatic reactions in children and how parents could possibly address it; (2) strengthening of physical, cognitive, behavioural, spiritual and emotional coping strategies. To do so, participants learned several techniques such as diaphragmatic breathing (Diaphragmatic breathing, or deep breathing, is breathing that is performed by contracting the diaphragm, a muscle located horizontally between the thoracic cavity and abdominal cavity. Air enters the lungs and the chest rises and the belly expands during this type of breathing. ), establishing a safe place, Jacobson relaxation session (Jacobson, 1929). A leaflet listing practical recommendations to cope with the symptoms of PTSD was also given to participants to encourage them to monitor sleep and eating patterns, do physical activities, participate in social and community activities and so on. The intervention was conducted simultaneously in March 2014 in two international NGOs acting with vulnerable children and their family in CAR: SOS Children’s Villages (SOS CV) and Action Contre la Faim (ACF). SOS CV is a major child protection organisation that leads protection, education and medical programs for children who have lost or are at the risk of losing parental care. ACF is a leading organisation in the treatment and prevention of malnutrition in humanitarian contexts.The stress management groups were offered to all categories of national staff. The groups were conducted by the authors who are both clinical psychologists trained in CBT. Twenty-seven stress management groups (SOS VE = 15, ACF = 12) were conducted in which a total of 197 national humanitarian aid workers took part. An assessment of PTSD, depression and anxiety was conducted the day before the intervention. 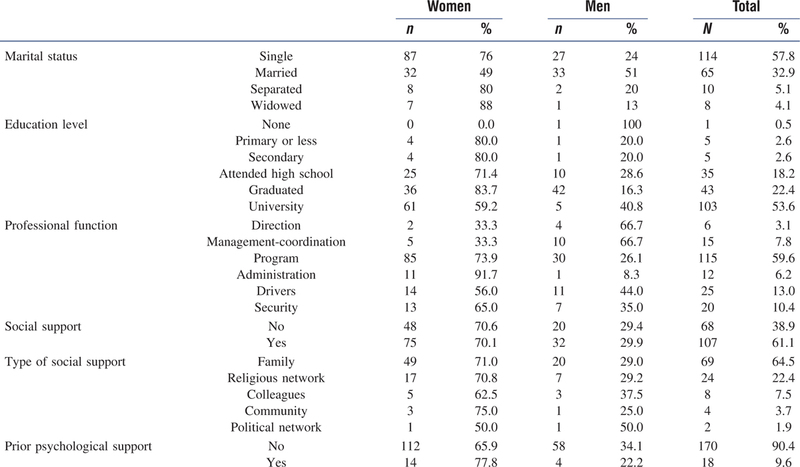 The sample, whose main characteristics are listed in [Table 1], comprised 68% women (n = 134) with an average age of 39.72 years (SD = ±7.84). Of all participants, 114 (57.8%) were single and 103(53.6%) had a university-level degree. They had an average of 3.41 (SD = ±2.69) children in their household. In terms of professional responsibilities, 64.2% (n = 124) of the participants work for programmes [health, nutrition, protection, education, and water, sanitation and hygiene (WASH)], 32.6% (n = 63) work in support positions (human resources, finance, administration or logistics) and 3.1% (n = 6) are in management positions.A total of 99 out of the 197 participants, that is, more than 50% of the pre-test sample, took the post-test assessment. When post-test assessment was possible, it took place an average of 8.22 days after the group intervention (SD = 6.47). The significant drop at post-test can be explained by the political situation at the time in CAR. Most participants who could not be reassessed were living in villages where violence escalated again after the intervention making impossible for authors to get security clearance to travel and perform the post-test assessment. As part of the pre-test and post-test assessment, study participants were invited to answer two self-reporting questionnaires. The Harvard Trauma Questionnaire (HTQ) (Mollica et al., 1992) is a screening instrument developed by the Harvard Program in Refugee Trauma (HPRT) to assess the effects of torture and psychological trauma. It has been shown to be the most reliable instrument in intercultural situations for people subjected to multiple trauma events (Hollifield et al., 2002). The HTQ version used in this study was validated for French-speaking populations in sub-Saharan Africa (de et al., 2012). It is composed of four separate sections. For the needs of the present study, only Part I and the first 16 items of Part IV were used. Part I lists a series of traumatic events. Participants were asked to list the traumatic events that they experienced since the coup d’état of March 2013. Part IV evaluates psychological symptoms that may be associated with trauma. The first 16 items reflect the DSM-IV-TR PTSD diagnostic criteria (American Psychiatric Association, 2000). Participants responded according to a four-point Likert scale (Likert, 1932): (1) not at all; (2) sometimes; (3) often; (4) most of the time. The HPRT recommends a cut-off score of 2.5 for PTSD, which was confirmed for this population by the French validation study. Anxiety and depression were assessed with the Hopkins Symptoms Checklist (HSCL-25) (Parloff et al., 1954). In the late 1980s, the HPRT began to use this tool to assess anxiety and depression in intercultural situations (Mollica et al., 1987). It includes 25 items and is divided into two parts. Part I has 10 items for anxiety symptoms and Part II has 15 items for depression symptoms. The two parts were based on diagnostic criteria for generalised anxiety disorder and major depressive disorder, respectively. Each question is rated on a four-point Likert scale: (1) not at all; (2) sometimes; (3) often; (4) most of the time. During the validation study for the French version of the HSCL (de Fouchier, Jehel, & Blanchet, in press), two items representative of depression in this population were added: ‘generalised body pain’ and ‘heat in the head and body’ (Fox, 2003; Rasmussen et al., 2007; Tang & Fox, 2001). The HPRT recommends a cut-off score of 1.75 as predictive of anxiety and depression diagnosis. A validation study for French-speaking populations demonstrated the need to raise the cut-off score to 2.5 to increase specificity. Statistical analyses were performed using the Statistical Package for the Social Sciences version 20.0 software (IBM-SPSS Inc., Chicago, IL, United States). Data from self-report questionnaires was used to derive descriptive statistical analysis. Comparisons between groups were performed using Student’s t-test, a chi-squared test, Pearson’s correlation and analysis of variance. To assess the impact of the stress management groups on psychopathology, paired-sample t-tests were performed for each of the psychological variables. Effect sizes were also determined using partial eta-squared (Cohen, 1988). Exposure to traumatic experiences: The participants were exposed to an average of seven (SD = 4.6) traumatic experiences [refer details in [Table 2]. Seven participants (3.6%) reported not having experienced any traumatic event. More than two-thirds (66%) of the sample had been exposed to five or more traumatic events. The most frequently reported traumatic events were having to hide (71.9%), having witnessed someone being beaten (62.7%), having lived through armed combat (65.6%) and having been separated from family members (59.5%). No difference was observed in trauma exposure between men and women (t(195) = 0.123, p = 0.903) or between those working as caregivers (working directly in contact with children beneficiaries) and those working as programme support (with no direct contact with children beneficiaries) (t(191) = −1.416, p = 0.158). Social support: At the time of the group session, 69 participants (39%) reported having received no form of social support. When available, social support came mainly from family members (n = 69; 39.2%) and religious communities (n = 24; 13.6%). Psychopathology: As indicated in [Table 3], the average scores for anxiety, depression and PTSD are slightly below the cut-off scores. However, 25, 18.9 and 26% of the participants display levels of anxiety, depression and PTSD scores that are above the cut-off scores respectively, indicating the need for clinical intervention. No difference was observed between men and women. The reported number of experienced traumatic events was weakly correlated with the scores of anxiety (r = 0.276, p = 0.000), depression (r = 0.234, p = 0.000) and PTSD (r = 0.203, p = 0.004). The average scores for each dimension of PTSD were 2.20 (SD = 0.85) for intrusion, 1.95 (SD = 0.74) for avoidance and 2.17 (SD = 0.77) for increased arousal.No significant differences were observed between humanitarian professional categories. However, staff in caregiver roles demonstrated considerably higher anxiety levels than non-caregiving staff (support staff) (t(190) = 2.52, p = 0.013). No psychopathological difference could be observed at pre-test between participants who participated in the post-test assessment and those who could not be reassessed: anxiety (t(194) = 1.68, p = 0.095), depression (t(194) = 0.33, p = 0.745) and PTSD (t(194) = 1.50, p = 0.135). Nevertheless, the number of traumatic events reported by participants who could not be reassessed was higher than among participants who were reassessed (t(194) = −3.63, p = 0.000). Scores after the intervention did not differ between the caregivers and non-caregivers. [Table 3] shows a significant decrease in the intensity of every psychopathological variable, with medium to large effect sizes. 67.6, 73.02 and 57.31% of the scores indicating symptomatic anxiety, depression and PTSD at pre-test, respectively, were no longer above cut-off at post-test. Qualitative feedbacks received during the post-test assessment showed that most participants experienced positive outcomes after the group intervention. The most appreciated benefits were improved sleep and a better ability to manage stress in everyday situations. Despite widespread humanitarian interventions across the African continent, the degree of exposure to traumatic events and subsequent psychological consequences for national humanitarian aid workers remain understudied. This study shows that nearly all (96.4%) of national humanitarian staff from CAR in this sample were exposed to at least one traumatic event. Consequently, they were at a significant risk of suffering from adverse mental health outcomes, with 25, 18.9 and 26% presenting scores indicating anxiety, depression and PTSD, respectively. As no epidemiological study of mental health disorders in CAR has been conducted, figures of this study cannot be compared with those of the general population. The most similar sample in terms of geography and culture cited in the literature is that of Ager et al. (2012) in a study of Ugandan national humanitarian aid workers. PTSD rates are comparable in the two populations, but depression and anxiety rates differ considerably. This difference stems mainly from the fact that the two studies do not use the same cut-off scores. The HSCL validation study for French-speaking populations (de Fouchier et al., in press) recommends a substantial increase − from 1.75 to 2.5–in the cut-off score for anxiety and depression to obtain acceptable specificity. It is interesting to note that if a cut-off score of 1.75 is used, as in the Ager et al. (2012) study, comparable anxiety and depression rates are obtained: 58.1 and 55.6% in the current sample compared to 53 and 68% in the Ugandan sample. The existence of a validation study for this specific population encourages to continue using a stricter cut-off score, which is also supported by compatible findings in the literature on the rates of anxiety and depression comorbidities to PTSD in the general population (Kessler et al., 2005; Kessler et al., 1995; Vaiva et al., 2008). Findings from this study provide important information about national staff working in caregiving positions in war contexts. This particular category of staff experiences higher degrees of anxiety. One possible hypothesis is that the caring dimension of their work in such an unpredictable and violent environment increases their vulnerability to stress, especially while working with children. Caring for highly vulnerable children in the need of protection, education, psychosocial and nutritional rehabilitation in a context of ongoing violence might increase the feelings of powerlessness and uncontrollability already inherent in a war situation. These employees should therefore benefit from supervision and emotional support as a priority. Shah et al. (2007) recommends that the funding of humanitarian programs should better integrate the professional and personal needs of national caregiver staff, to prevent the risk of anxiety disorders and STS. Our results suggest that it would be clinically relevant to offer an additional group intervention for caregiver aid workers to address their specific mental health needs. As such, donors have a responsibility to finance and avail resources to enable interventions that aim at protecting and promoting the psychosocial well-being of national humanitarian aid workers, because it is a dimension known to be correlated with work effectiveness (National Institute for Clinical Excellence, 2009). The second objective of this study was to evaluate the therapeutic impact of a one session stress management protocol adapted to the specific context of repeated and ongoing violence. Results demonstrate the effectiveness of the protocol with significant, and medium to strong therapeutic effects on anxiety, depression and PTSD. The least effect of the intervention is on arousal symptoms. This can be understood as an adaptive and functional mechanism, because hypervigilance and startled reactions allowed better adjustment to violent situations. In that sense, the merits of a therapeutic technique that focuses on reducing protective reactions to violence would, therefore, need to be strongly questioned. A large part of the group session was dedicated to psychoeducation on stress and traumatic stress in adult and in children. Adapting psychoeducation was essential in this specific African cultural context where mental health problems are often associated with spirit and witchcraft beliefs and high stigmatisation. The first essential part of psychoeducation was to enable participants to express which specific cultural beliefs were associated with their current symptomatology. For example, most group participants explained that flashbacks or nightmares were the signs of being bewitched. In a second phase of psychoeducation, the neurobiological model that underlines the symptoms of PTSD was presented and a discussion emerged on how these explanatory models can coexist. For some participants, the medically oriented explanation regarding their symptomatology gave them a sense of relief. By providing a psychological intervention that is more structured and specialized than psychological first aid (PFA), this protocol offers a realistic and effective response to the suffering of this population who have no access to specialised care. The proposed protocol lies between PFA and a standard CBT treatment protocol. The latter facing challenges related to receiving sufficient funding in the current context of humanitarian resources (McKay & Williamson, 2011). For the protocol to be efficient, the provider needs to have a good understanding of what is psychological trauma and what are the recommended psychological interventions to treat it. Therefore, it is recommended that the protocol be delivered either by a mental health professional or by a lay counsellor who has received extensive training to do so.Conducting research on psychological interventions in a context of ongoing war is extremely challenging in terms of logistical and methodological constraints. The impossibility to reassess part of the sample at post-test, the lack of mid to long-term reassessment are major limitations to generalise the results found in this study. In a context of ongoing war and violence, reassessing people 3, 6 months or a year after a psychological intervention is questionable, because people are likely to be exposed again to new traumatic events. Therefore, Mundt et al. (2014) recommend focusing on immediate effects when evaluating interventions in unstable settings. The fact that non-reassessed participants reported a higher number of traumatic events is not surprising, because they were leaving in remote rural areas of the country where episodes of violence were reported more frequently. Although the absence of demographic and psychopathological differences between the two groups can temper this limitation, further studies are needed to confirm that the results found are replicable regardless of the reported number of traumatic events. In conclusion, a single session stress management group is a feasible and cost-effective psychological intervention to improve psychosocial well-being of national humanitarian aid workers living in the contexts of ongoing violence. It makes it possible to care for a significant number of staff in a short period and with very little financial investment. Further research is needed to confirm the applicability of the current protocol in other humanitarian contexts. Beyond the psychosocial response that can be offered to national humanitarian aid workers, many studies (e.g. Ager et al., 2012; Eriksson et al., 2013; Lopes et al., 2005) underline the importance of strengthening certain protective factors including social support, team cohesion and limited exposure to chronic stressors through institutional practices. International NGOs are responsible for the prevention of mental health disorders and psychological distress related to work among their staff. It is therefore crucial that institutional practices evolve and that donors enable INGOs to financially honour, as best they can, their duty of care (Inter-Agency Standing Committee, 2007). The authors wish to thank Sandrine Zuger, Action Contre la Faim (Action Against Hunger), who assisted with data collection. American Psychiatric Association. (2000). Diagnostic and statistical manual of mental disorders: DSM-IV-TR (4th ed., text revision ed.). Washington, DC: Author. Amnesty International. (2015). Report 2014/15: The state of the world’s human rights. London: Author. Cohen J. (1988). Statistical power analysis for the behavioral sciences (2nd ed.). London: Routledge. de Fouchier C., Jehel L., Blanchet A. (in press). Validation of a French adaptation of the Hopkins Symptoms Checklist among torture survivors from sub-Saharan African countries. European Review of Applied Psychology. Ehlers A., Clark D. M. (2003). Early psychological interventions for adult survivors of trauma: A review. Biological Psychiatry, 53 (9), 817-826. Foa E. B., Keane T. M., Friedman M. J., Cohen J. A. (2005). Practice guidelines from the International Society for Traumatic Stress Studies (2nd ed.). New York: Guilford Press. Fox S. H. (2003). The Mandinka nosological system in the context of post-trauma syndromes. Transcultural Psychiatry, 40(4), 488-506. Hollifield M., Warner T. D., Lian N., Krakow B., Jenkins J. H., Kesler J., Westermeyer J. (2002). Measuring trauma and health status in refugees: A critical review. JAMA, 288(5), 611-621. Inter-Agency Standing Committee. (2007). IASC guidelines on mental health and psychosocial support in emergency settings. Geneva: Author. Jacobson E. (1929). Progressive relaxation. Oxford: University of Chicago Press. Kessler R. C., Sonnega A., Bromet E., Hughes M., Nelson C. B. (1995). Posttraumatic stress disorder in the National Comorbidity Survey. Archives of General Psychiatry, 52(12), 1048-1060. Likert R. (1932). A technique for the measurement of attitudes. Archives of Psychology, 22(140), 1-55. Mollica R. F., Caspi-Yavin Y., Bollini P., Truong T., Tor S., Lavelle J. (1992). The Harvard Trauma Questionnaire. Validating a cross-cultural instrument for measuring torture, trauma, and posttraumatic stress disorder in Indochinese refugees. The Journal of Nervous and Mental Disease, 180(2), 111-116. Mollica R. F., Wyshak G., de Marneffe D., Khuon F., Lavelle J. (1987). Indochinese versions of the Hopkins Symptom Checklist-25: A screening instrument for the psychiatric care of refugees. The American Journal of Psychiatry, 144(4), 497-500. Mundt A., Wünsche P., Heinz A., Pross C. (2014). Evaluating interventions for post-traumatic stress disorder in low and middle income countries: Narrative Exposure Therapy. Intervention, 12(2), 250-266. National Institute for Clinical Excellence. (2005). Post-traumatic stress disorder (PTSD): The management of PTSD in adults and children in primary and secondary care. London: Author. National Institute for Clinical Excellence. (2009). Mental wellbeing at work. London: Author. Neuner F., Onyut P. L., Ertl V., Odenwald M., Schauer E., Elbert T. (2008). Treatment of posttraumatic stress disorder by trained lay counsellors in an African refugee settlement: A randomized controlled trial. Journal of Consulting and Clinical Psychology, 76, 686-694. Parloff M. B., Kelman H. C., Frank J. D. (1954). Comfort, effectiveness, and self-awareness as criteria of improvement in psychotherapy. The American Journal of Psychiatry, 111(5), 343-352. Robjant K., Fazel M. (2010). The emerging evidence for Narrative Exposure Therapy: A review. Clinical Psychological Review, 30, 1030-1039. Shah S. A., Garland E., Katz C. (2007). Secondary traumatic stress: Prevalence in humanitarian aid workers in India. Traumatology, 13(1), 59-70. Stoddard A., Harmer A., Czwarno M. (2017). Aid worker security report 2017: Behind the attacks: A look at the perpetrators of the violence against aid workers. New York: Humanitarian Outcomes. Stoddard A., Harmer A., Ryou K. (2014). Aid worker security report 2014: Unsafe passage. Road attacks and their impact on humanitarian operations. New York: Humanitarian Outcomes. Tang S. S., Fox S. H. (2001). Traumatic experiences and the mental health of Senegalese refugees. The Journal of Nervous and Mental Disease, 189(8), 507-512. Taylor G., Stoddard A., Harmer A., Haver K., Harvey P., Barber K., Wilhelm C. (2012). The state of the humanitarian system. London: ODI. Van der Kolk B. A., McFarlane A. C., Van der Hart O. (1996). A general approach to the treatment of posttraumatic disorder. In: van der Kolk B. A., McFarlane A. C., Weisaeth L. (Eds. ), Traumatic stress: The effects of overwhelming experience on mind, body, and society (pp. 417-440). New York: Guilford Press.